You love the fast-paced, intense workout you get from squash and enjoy the social side, but it’s not always easy trying to find someone to play with or finding the time. That’s where Squash 101 can help. Squash 101 is a new, alternative way to play squash that gets groups of people on court together more regularly. Squash 101 is a regular session for adult players that is fun, inclusive, social and easy to get started. 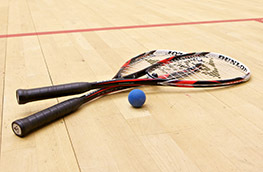 Use the squash finder to find a Squash 101 session at a club or venue near you. Squash 101 is run by a leader who'll put you through your paces with fun, challenging activities with like-minded players. You’ll undertake individual and team challenges, honing your racket and ball skills then put them into practice in game situations. The sessions are fun, informal, social and different every week. This is social fitness at its best! Ready for action? Use our squash finder to locate your nearest session. Interested in becoming a Squash 101 Leader? Find out more here. Find out how your club or venue can attract new players with Squash 101. A team of Squash 101 Champions drive the Squash 101 programme at a local level by supporting venues and newly trained leaders to get started with Squash 101. Find our more.